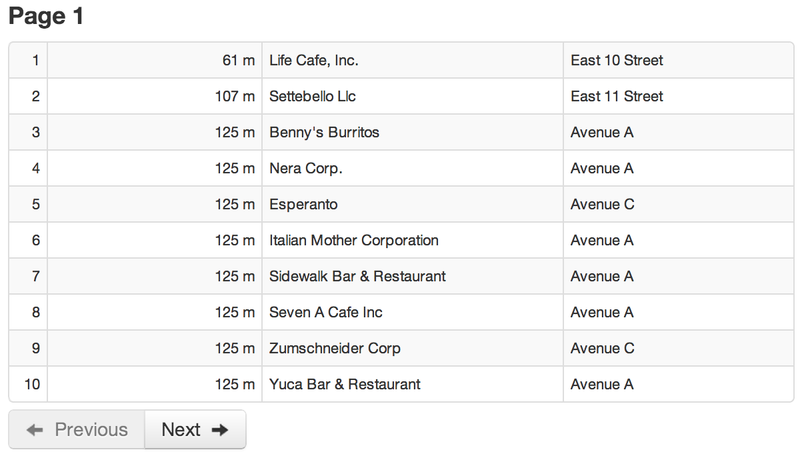 The latest development release of MongoDB includes a new minDistance option for geospatial queries. This is exciting because it lets you page through geospatial results very efficiently, and because it's the first feature I've contributed to the database itself. I'll measure how minDistance performs and show you an example app. 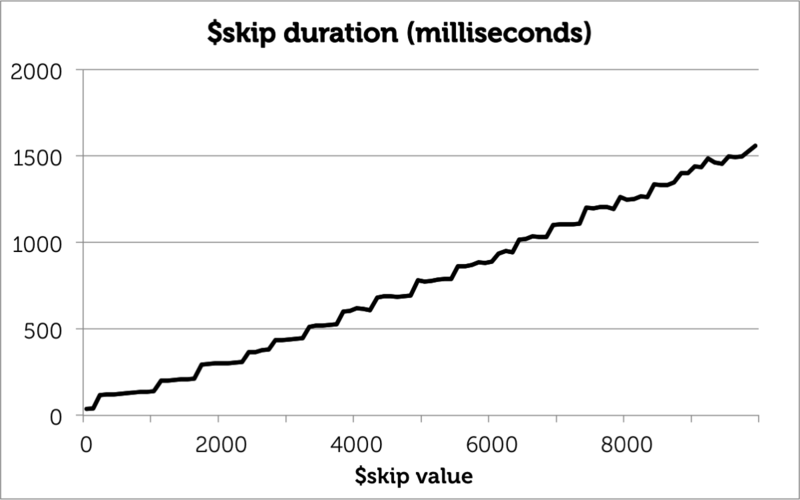 As the $skip number grows from zero to 10,000, the duration grows linearly, even though the query always returns 10 results. After all, in order to get those 10 documents, MongoDB must find all the prior documents and pass them through the aggregation pipeline, only to discard them at the $skip phase. Paging through geo results is obviously useful, so how do we do it efficiently? MongoDB 2.5.1 was released Wednesday with a new minDistance option for geospatial queries. This is my first contribution to MongoDB's C++ code—generally I work on Python. Hold your applause, please: I just wired together some mechanisms built by minds greater than mine, and even so I needed a lot of handholding from Hari Khalsa. However simple the feature was to implement, it makes paging through geo results much faster. ... then I set minDistance to 268 and query for the next 10 documents. I must also exclude this document's id to avoid seeing it again in the next batch, since minDistance is inclusive. 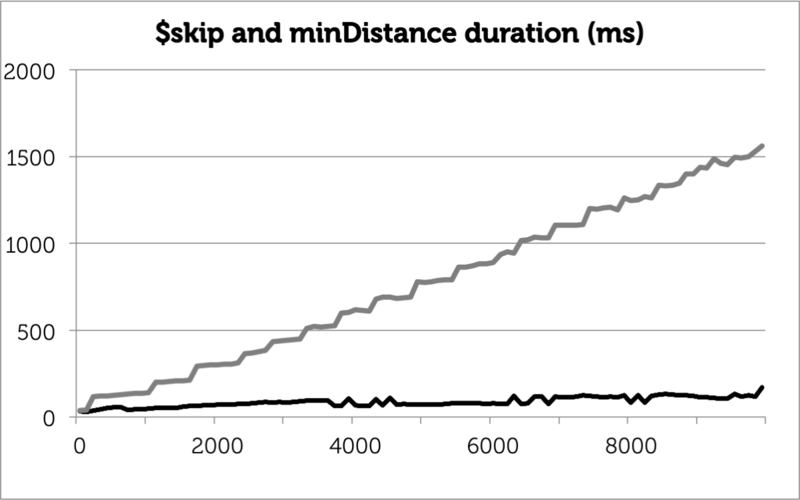 The first batch performs the same as it did with the aggregation framework, but the final batch takes one tenth the time with minDistance as it did with $skip: 170ms instead of 1.6 seconds. # Last result is farthest. # farthest. Append to last_ids. This takes care of paging forward from the nearest 10 cafés to the farthest. How do we go backwards? Unfortunately, the geoNear command doesn't support searching inward from a maxDistance: it always iterates from near to far. My solution is simply to cache results as I retrieve them. So when you click Previous in my app, it shows you the previous page from the results it keeps in memory. If you hit Next again, the app checks whether it has the next page of results cached, and if so avoids the round trip to the server.